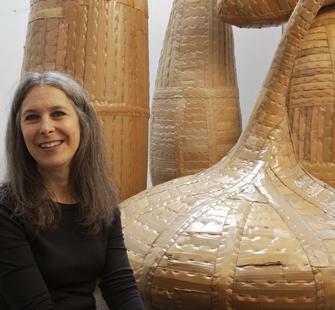 California artist Ann Weber transforms the ordinary medium of cardboard into impressive large-scale sculptures reminiscent of pods, gourds and organic spires. The sculptures have the appearance of large baskets woven into monumental forms with a rich patina created from layers of shellac applied to the surface. Visitors walk among and through the towering shapes, some as large as 16 feet tall, in an oversized wonderland of contoured forms. Weber, who began her career as a ceramic artist, started working with the lighter medium of cardboard in 1991 and finds great interest in the possibility of making beautiful objects from common and mundane materials. Weber received her BA from Purdue University and her MFA from the California College of Arts and Crafts where she studied with renowned ceramic sculptor Viola Frey. A San Francisco Bay Area Sculptor who is active in the public art field, Weber has won award commissions for sculpture at the State Capitol building in Sacramento, a Public Library for the city of Phoenix and two bronze sculptures for Skyline Park in Denver, Colorado. She has been featured on Spark! a television program on KQED about Bay Area artists and has received a California Arts Council Fellowship Grant. She just finished a month long artist-in residence at the de Young Museum of San Francisco and is invited to create sculpture at the internationally acclaimed Artist in Residency Program at Montalvo Arts Center, Saratoga, California in June 2010. She is represented in San Rafael, California at the Donna Seager Gallery where she had a solo show in Fall 2009. A large solo exhibition is currently on display in Newberg, Oregon, near Portland, for the inaugural exhibition opening of the Chehalem Cultural Center. Recent exhibitions include the Stremmel Gallery in Reno and Afterlife at the Institute for Contemporary Art in San Jose. Also: Alchemy at the William Havu Gallery, Denver, Colorado; This End Up: Cardboard Sculpture, San Jose Museum of Art, San Jose, California and Corrugated: Sculpture by Ann Weber at the Boise Art Museum. "Here is joy and here is wonder!"